Why make paper lens hoods? 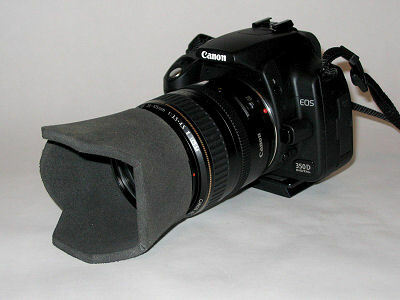 All camera lenses benefit greatly from the use of lens hoods. A lens hood cuts out the majority of nonimageforming light, thereby reducing glare on your photos. In that respect, a paper lens hood performs identically to a real plastic or metal lens hood, except it doesn't cost you any more than a sheet of paper. The only real different is that a paper or card lens hood may not be as strong as a real plastic lens hood. Are these lens hoods really free? Yes, they are completely free. You may download and print as many as you want. All we ask is that you spread the word, either by linking to this site or by telling your mates. What's the best material for these lens hoods? If you wish to have a sturdier lens hood, you should print it onto card or thin plastic. Printing on darker materials will be best, as these will offer reduced internal reflections. But remember - even a white paper lens hood is better than no lens hood at all! What do I need to print the lens hoods? Each lens hood is in PDF format. You may need to download and install Adobe Reader before you can open these files. What's the best way to fit these lens hoods? After you have cut out the hood and glued it together to form a cone, you should place the tabs over the end of the lens and secure it with an elastic band. This allows the lens hood to be easily removed. You may use black electrical tape or gaffer tape if you desire a more permanent fixture. Why are there both petal and rounded versions? Because photographs are rectangular in shape, petal hoods offer the best performance by blocking most nonimageforming light. For this reason, it is important to make sure that you mount a petal hood the correct way up, making sure the longest petals are located at the top and bottom of the lens, with the shorter petals to the sides. Petal hoods are not suitable for all lenses, so simpler rounded versions are also provided. Rounded lens hoods are much more suitable for tilt-shift lenses or any lens where the end rotates when zooming or focussing. What do I do if my lens hood causes vignetting? Due to the large number of lens hoods available on this site, we are unable to test all of them on all combinations of camera bodies, so please let us know if you have had to make any modifications to your lens hood. Can I advertise on these lens hoods? Yes. Please contact us if you would like to advertise on our lens hoods. Your company name and/or web site address can be featured on either the lens hood itself, or to one edge of the PDF document. This site was launched in October 2008, two years after the incredibly successful launch of its partner site, www.lenshoods.co.uk, which caters for full frame SLR sensors. The original site continues to be mentioned regularly in photography forums and has received several millions hits to date.